[APRIL 23, 2003] "A Stone in My Hand" by Cathryn Clinton. Candlewick Press, 2002, 191 pages. 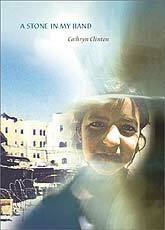 This is a moving story set in Gaza City during the intifada of 1988. Using the glossary at the back of the book, I learned that the word "intifada" refers to the uprising that began in December 1987 in the Occupied Territories of the West Bank and Gaza Strip. The word actually means "to shake off." The main character in the story is an 11-year-old Palestinian girl named Malak. She lives with her mother, older sister Hend, and 12-year-old brother Hamid, with whom she shares a love of poetry. A month before the story begins, her beloved father left on a bus headed for Israel to look for work and never returned. Since his disappearance she has not spoken to anyone except a dove. She named the dove Abdo and believes that her father sent it to her. Every day she climbs up on the roof to wait for his return and to feed Abdo some seeds. Malak envies Abdo's ability to fly away. She says of herself that she lives through Abdo and will fly away from everything some day. The authorities closed all the schools the day after Malak's father disappeared, and they didn't reopen for more than a month. Malak is nervous about going back to school, but her mother thinks it will help her. Hamid walks her to school every day and then goes on to his school. Hend had to quit school to take a job with her mother. Malak's first day back is a disaster, but the second day she meets a girl named Rula. They become good friends and their friendship is very healing for Malak. Life seems to be the hardest for young Palestinian men, and Hamid and his friend Tariq (who saw his own father killed by Israeli solders) are no exception. Against the wishes of their mothers, both young men have become "shabab" (defined here as "youth activists") and are involved in some terrorist activities. The favorite of the young men is to throw stones at the soldiers and run. If they are caught, they will be shot. So far Hamid and Tariq have been able to outrun the soldiers, but many of their friends have not been as lucky. Malak believes her father must be in prison somewhere and cannot contact them. She wishes that she could visit him the way that Rula visits her father. She presses her mother until she tells her the truth about her father and how he died. The bus that he was riding in was blown up by the Islamic Jihad, the very group that her brother is involved with. Malak is devastated and becomes withdrawn again. Hamid is very confused and angry, as he becomes more involved in the violence. Malak's family is falling apart, and she realizes that she must do everything she can to save it. This story does not have a happy ending but a realistic one. It gives American children a picture of what life is like for children who live in the middle of the conflict in the Middle East. The Israeli army and the terrorists are portrayed equally as harsh. There are no political statements, just a realistic picture of the life of one family. This book is recommended for children age 11 through adult. For more information, please visit the library at 725 Pekin Street or call (217) 732-5732.